SET OF GOLF HYBRIDS-SINGLE LENGTH ????? Golf hybrids have become increasingly popular among amateur and professional players these days, and for good reason. These clubs, for the uninitiated, are a cross between an iron and a fairway wood. These clubs are much easier to use than irons, making it simple for all players to get their shots airborne. They have compact heads which are perfect to use from the fairway or the rough. In addition, the shaft on a golf hybrid is slightly shorter than that on a wood, giving you more control with your shots. Now that we all have had a few years to try all those O.E.M. 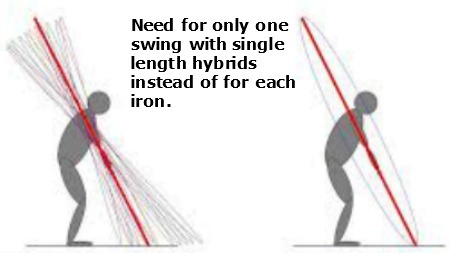 golf hybrids, you would think that someone would come out with some kind of direction in what you should be hitting and why. Well, we have figured it out, and I think you will be surprised by the results. Further details to follow, but for now we want you to replace your long irons, up to the 6 iron, that are getting harder and harder to hit, especially golfers with swing speeds eighty miles per hour and less, with a set of technically identical golf hybrids. Golfers believe, correctly, that consistent performance is significantly improved by the use of a matched set of clubs. However in the context of MOI and swingweight, the term "matched set" truly means that all the clubs in a set will each require the same exact effort and feel exactly the same when they are swung. There is only one way to realize such a set of clubs. ·All of the clubs use the same exact shaft and grip models with all of the shafts being of equal weight, length, flex and balance point. .The lie angle of each club in the set would have to be the same since all clubs are made to the same playing length. ·All of the club heads in the set weigh exactly the same with each head's center of gravity in the same location from head to head, and identical face angle. If such a set of club heads can be obtained, the shot making ability of each club for spin and distance and trajectory will be controlled by loft alone. Club Length of your favourite hybrid. Lie: Very N.B. as your set of SLVL hybrids will each have the same lies. Loft: Lofts on your SLVL's will be in 4 to 5 degrees separation to match your club set-up. REMEMBER: YOU CAN NOT MODIFY ANY O.E.M. HYBRIDS. THEY MUST BE WISHON 775HS HYBRID HEADS. Through Hand Select and Bending Service, these hybrid heads can be ordered in any lie angle from 4* upright to 4* flat. - in any face angle from 4* open to 4* closed from each model's face angle design spec. No other hybrid heads in the world can offer such a wide range of the two key specifications on the same head, all together. Through Wishon's unique hosel and sole bores, we are able to weight all the heads in your set to weigh the same, thus obtaining the same swingweights for all your hybrids. Thanks to 1 Iron Golf for the above Image. This ensures maximum ball striking consistency coupled with ease of play. There is only one swing and one ball position to ingrain). I too have tried numerous golf hybrids over the last few years, but of course they were all Tom Wishon's. Tom has come up with his best hybrid head design yet. 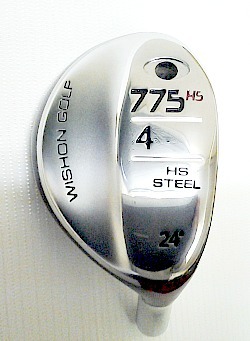 Go to www.golfclub-technology.com/hybrids.html and read up on his 775HS head. Pay attention to the HS. It stands for high strength steel, and these faces are extremely hot. I found that my favorite hybrid was my #4, and it was 39.5 inches long, had a lightweight, high launch, shaft, the Wishon S2S White Hybrid Regular shaft, a swingweight of D2, my favorite grip, had a LIE of 60 degrees and a LOFT of 24 degrees. This is the key to your new set of golf hybrids. You must find your best hybrid and know what it is. After a sudden back injury (herniated all five lower lumbar discs), I found hitting the low irons extremely difficult and punishing. It not only was mentally difficult to make a proper divot to hit the lower irons, but it physically really hurt and may lead to further injury to the back. After hitting my #4 hybrid with ease and accuracy, I started to wonder, why not see how many lower irons I could replace. WOW-what a revelation-not only could I hit the #2 high and accurate, but the #6 hybrid turned out to be my favorite club. Now, the most important part of this whole experiment is that I built every golf hybrid identical, in all ways. Thus- one swing, one ball position and voila- consistent shots with about twelve yards distance separation between each club. You can’t buy these off the rack. After completing the shallow face, 0.830 COR design of the 949MC fairway woods, Wishon began to speculate whether it might be possible to push the envelope of high COR face design one step farther and create a golf hybrids clubhead with its COR also at the limit imposed by the Rules of Golf. While golf hybrids had been introduced to golfers in the late 1990s, as of 2007 no company had yet marketed a hybrid with a high COR. Again, because of the smaller face size of a typical hybrid clubhead, the industry had felt hybrids had too small of a face to be able to engineer their design to flex inward enough at impact to generate a high COR. Having designed the first high COR irons in 2004 (770CFE irons) and just coming off having created fairway woods with a 32mm face height with a high COR (949MC woods), Wishon felt it could be possible to create a high COR hybrid design. What made this possible was the fact that at the time, golf hybrid clubheads typically were being designed with a taller face height than most fairway woods. While the width of a hybrid face was less than that of a fairway wood, being able to design the face with a little taller face height allowed Wishon to get enough face area that when combined with a very high strength steel alloy formed to a thickness of only 1.6mm, a COR of right under the USGA limit of 0.830 could be achieved. I can't emphasize more, how much fun these hybrids are to play with. My index has dropped by 2 and my approach and par three shots are making my playing partners very upset. If you wish to discuss this concept more, please call 226-785-1396 or e-mail me at rmckinney@rogers.com and I can even price you out a set. It is amazing how many sets of these SLVL hybrids I have built. You can not get these hybrids anywhere else but thru a custom club builder, and Tom Wishon's 775HS hybrid heads. Any of the O.E.M. company hybrids can not be modified to make a truly matched set. GOOD LUCK and GOOD GOLFING!!!!!! S2S Blue: 50 gram. For average ability golfers who need the lightest total weight. S2S White: 70 gram. For average ability golfers who need a light weight shaft. 5 Iron swing speed: 45 to 85 m.p.h. AA, A, R, S flexes. S2S Red: 80 gram. For players with a semi-late release and above average strength. S2S Black: 90 gram. For players with very late release and above average strength. $ 199.00 Cdn. + taxes & shipping.